What's not to love about this big, beautiful girl? Sheika currently calls the Humane Society of Missouri animal shelter in St Louis home. She's looking for a forever home with some people to call family. 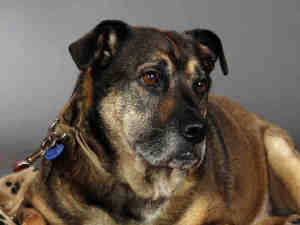 Sheika is a spayed female, black and tan senior German Shepherd Dog mix. HSMO shelter staff think she's about 7 years old. A calm, mellow sweetheart of a dog is looking for a companion to rub her belly and scratch her ears. She'd also enjoy taking some leisurely strolls. This gentle dog soul has been at the shelter since April 2012 and is a favorite of the staff and volunteers there. If you have room in your heart and on your couch, contact the HSMO at 314-951-1562 for more information on Sheika ID#A523321. We hope she finds a forever home too! Senior dogs are awesome and need homes too. We just wrote about Tim Lincecum, the SF Giants pitcher, and how he is helping senior dogs! We are keeping our paws crossed for you, Shieka!